May has come under fire from huge sections of her own Conservative Party over her deal and is facing a revolt ahead of Tuesday’s scheduled vote on her deal in the House of Commons. “If you want Brexit, make sure you get it, and that’s about this deal,” she said. 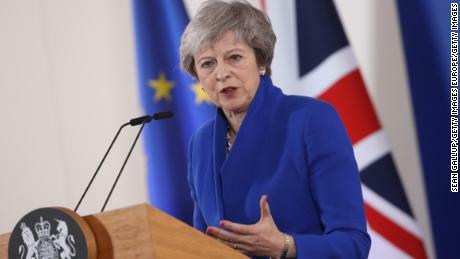 May also rejected the growing clamor for a second referendum, or “People’s Vote” which a number of lawmakers have called for in the absence of a deal. “We had a people’s vote, that’s what frustrates me when people talk about this, the second referendum being a people’s vote, ” she added. May is facing pressure from some sections of her party over her deal, particularly the backstop arrangement for the Northern Ireland border. Tuesday’s vote is likely to be tense, with Labour, Liberal Democrats, Scottish National Party and Northern Ireland’s Democratic Nationalist Party, which has propped up the government since the general election in June 2017, all set to vote against the deal. Speaking on Sky News’ Sophy Ridge on Sunday, Conservative lawmaker Esther McVey, who quit the Cabinet over the Brexit deal last month, warned that defeat for May would mean she should “immediately” return to the European Union to “get a better deal” if she loses in the Commons. The government’s perilous position has led to speculation that Tuesday’s vote may be rescheduled with May reportedly struggling for numbers. But Steve Barclay, her third Brexit Secretary, insists the vote will go ahead as planned. “The vote is going ahead,” he told the BBC. Mahatir Pasha in London contributed to this report.